The Washington Nationals had a hot dog quandary. Due to their geographical location, they serve fans from several distinct regions. The most prominent being Delaware, Maryland and Virginia. To complicate matters, each of areas have their taste preferences. Their problem was how does a team serve up a hot dog that satisfies all of those diverse tastes? 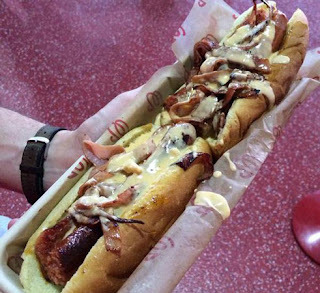 Not to be confused with the Department of Motor Vehicles, the DMV Dog caters to the Delaware, Maryland and Virginia fans by creating a confluence of ballpark favorites. It is a double dog (two hotdogs end to end) containing a half-smoke sausage for the frank, Maryland crab and Virginia ham. How is that for a home run of a dog? It cost $12 but it WILL be the only thing you eat at the ballpark. Again, the DMV Dog does not stand for "Department of Motor Vehicles." If it did, you would have to stand in the concession line for 2 hours only to be told they were not serving it that day. Fortunately, Nationals Park serves it every game. Get one.